In a garden, shrubs thicken over time preventing sunlight from reaching the middle of the plant. If not corrected, the shrub may begin to die. A gardener prunes or thins the branches so that sunlight can feed the entire plant. Similarly, removing old pine trees from a wooded thicket will accelerate the growth of the remaining hardwoods. Apply the 80/20 rule  to your product and service offerings and eliminate those which require a lot of effort but return little in sales or profits. This process will free up capital and other resources to support faster growing products and services. Prune vigorously to accelerate revenue growth. Gardeners till the soil around their plants because loosening the soil gives the roots room to grow and allows water and other nutrients to more easily reach the plant’s roots. In a business context, tilling the soil involves creating opportunities for customers, employees, and associates at all levels to identify and develop ideas for creating new products and services, improving existing ones, lowering costs and better serving customers. More often than not, your customers and employees know what needs to be done to increase your value. Ask them, pay attention and then act on their advice. Product and service offerings, as well as customers, are like shrubs and flowers – sometimes they wither and die leaving gaps in the product line or the customer base. Gardeners respond to this natural process by regularly filling in the gaps in their gardens with new plants. You must also steadily infuse your business with new products and services, as well as new customers, if your offerings are to remain competitive in the marketplace and satisfy the needs of your customers. If you are not constantly seeking new places to insert seedlings, you are not planting enough seedlings. Gardeners spend a lot of time pulling weeds from their gardens lest the weeds multiply and choke the garden. Pulling weeds is exhausting, thankless, and never-ending. Excessive or unnecessary costs are the weeds in your business garden. They are the enemy of profitable operations. Businesses which successfully improve owner value over extended periods of time have regular programs for identifying and eliminating business activities and costs which are not essential to driving revenue and long-term growth or required to satisfy regulatory or other mandatory activities. No one likes to weed, but everyone in the business must participate for the effort to be successful. Gardeners invest in their gardens through regular applications of Miracle-Gro®  or similar products to ensure that their plants receive all the nutrients essential for healthy plant growth. Your business also requires regular investments in capabilities, people, and other resources to support growing product, customer, and market opportunities. Investment resources are often expensive or scarce and must be carefully allocated among competing projects to achieve revenue growth coupled with improving profitability. Gardeners use chemicals, fencing, and other devices to protect their plants and ward off insects and other pests. Without such protection, the garden’s beauty and productivity may be dissipated. Business pests include lapses in your own customer service as well as competitor incursions onto your turf. Providing outstanding service and value to your customers is also one of the best ways of keeping competitors at bay. Additionally, assign someone in your organization to monitor competitor activities to avoid surprises. Defending against pests is like pulling weeds – both require constant vigilance. In the hot summer sun, water is essential for healthy, growing plants. Plants also need extra water in the fall to carry them through the winter when the frozen ground prevents their roots from taking up water. All areas of your business require regular management attention and inspection if you are to maintain healthy revenue growth and flourishing profit margins. You can only expect what you inspect, or as Tom Peters is fond of saying, “nothing ever happens until you show up.” Apply management attention liberally for best results. Employ these successful gardening techniques in your business on a regular basis and watch your business’ equity value multiply. EBITDA means earnings before interest, taxes, depreciation and amortization. 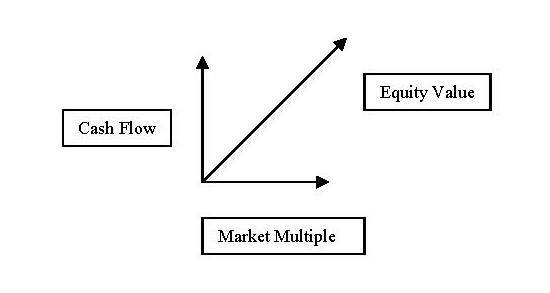 The market multiples described here are usually the result of actual negotiated transactions observed in the marketplace rather than the manner in which the prices were determined beforehand. Buyers use many different techniques including discounted cash flow analyses, prices of comparable transactions, and trading multiples for similar publicly-traded companies to determine the price they are willing to pay for a business. While such market multiples provide useful shorthand for talking about business values, they are not a substitute for a thorough analysis of a specific business by a qualified investment banking or valuation professional. Enterprise value usually means the value of a business’ operating assets without regard to how they are financed. Residual or owners’ equity value is usually defined as enterprise value + excess cash in the business – outstanding business debt. For simplicity, we have ignored capitalization considerations in this discussion. A common multiple range might be 5 to 7 times operating cash flow for a small or mid-sized mature operating business with slow or moderate growth rates (single digits). Alternatively, technology-based or early stage companies may trade on the basis of a multiple of revenue because their current level of profitability does not yet reflect mature operations. Whether a particular transaction can achieve a 5, 6, 7 or some other multiple depends on numerous other factors including market position and share; level of proprietary technology, product or service offerings; relative revenue growth rates; and relative levels of profitability. According to the Pareto Principle or 80/20 rule, 80% of revenue and profit contribution usually come from 20% or fewer of the products sold or customers serviced. Programmatic tools which can be employed to systematically reduce costs include activity based costing, zero-based budgeting, and economic value added analyses. If you are also into gardening, Miracle-Gro® has some timely gardening tips at www.miraclegro.com.